Music :: The Nigeria No. 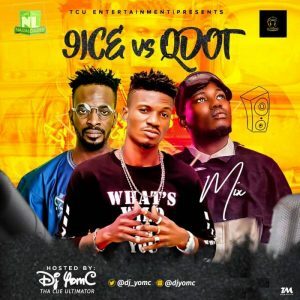 1 Most visited Music & Entertainment Website Naijaloaded teams up with the CEO of TCU Entertainment Tha Cue Ultimator DJ YomC, in dropping some thing bizarre, in nutshell, the most anticipated and unexpected Mix has been proudly brought to you on this platform. supported by both artists featured on it, QDot & 9ice , this has come as a surprise to your fans though, yet y’all fans have to take it, has this mix is more of a musical battle between the two spiritual and motivational singers. Mixtape has been reviewed several times to ensure its standard and Mix worthy, y’all should update your playlist by clicking on the download button. DJ YomC also therefore promise his fans more of Best of Nigerian Artists Mix, you should keep anticipating what next.